I spotted this mural on Queen St W in the Parkdale neighbourhood and managed to work my way around some parked cars to get a pic. 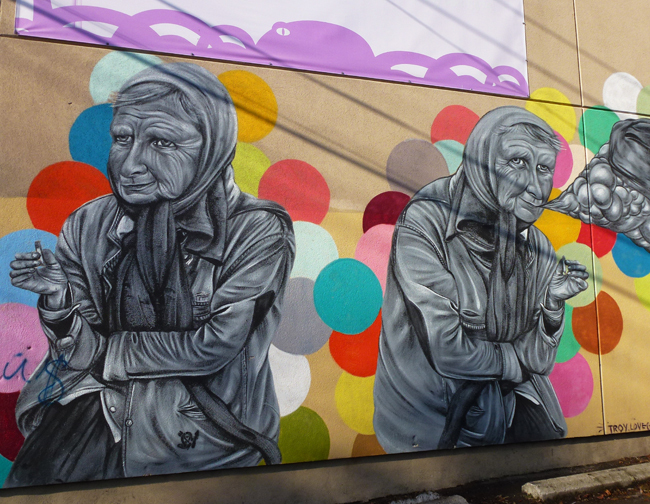 It isn't too often that you see an older person featured in a mural especially one having a smoke. The artist for this one is Troy Lovegates who used to be known as Other. He has done murals worldwide and has done many in Toronto although he no longer lives here. She is smoking marijuana, and that's why she's got such a goofy grin on her face. She's in a lot of pain but the Mary Jane helps her deal with it. There's just no other way to understand this mural, in my mind! :) You do find the most interesting murals. We have very few down here. ...does wonderful things to you! Interesting point of view from Lowell. My first thought was that smoking makes a person age faster The ladies are not as old as they look! I'm not sure I understand the message here if there is one but your commenters above might have some good thoughts on the subject. The mural is beautifully painted by a talented artist and I quite like that an older person is depicted even with the unfortunate cigarette. Older people and cigarettes are not the usual subject for murals, but this one is very well done. I like the colourful background. Interesting contrast between the figures and the colourful background. I like this mural, it's well done. I see a lot of older people here that smoke and it always surprises me but I assume they know the risks but just don't care. I read an article about the artist who painted this mural and he apparently spent a lot of time in an old folks home that his parents managed, which might explain why most of his characters have craggy old faces. Shouldn't there be an anti smoking warning at the bottom of the murial? Great mural. Older people you don't see often and then smoking. Very nice and lifelike. Looks to me like she has an illegal smile on her face. Fine mural. Lots of detail. I like the folds in the jacket and wrinkles on the face. The artist has totally captured the look, and such lovely detail and color! It's fantastic Pat, a lot of art!! Interesting....appears to be the same lady in mirror image but with a cloud of smoke added...? Excellent detail! I've seen it but yet to get a picture. The model was 18. That is what happens when you smoke.